7 Primary School targeted lesson plans covering celebrating difference, families, relationships, gender awareness and LGBT people in history. 10 Secondary School targeted lessons plans on prejudice-based language or bullying, lesbian, gay, bisexual and trans lives, social media, prejudice and gender. 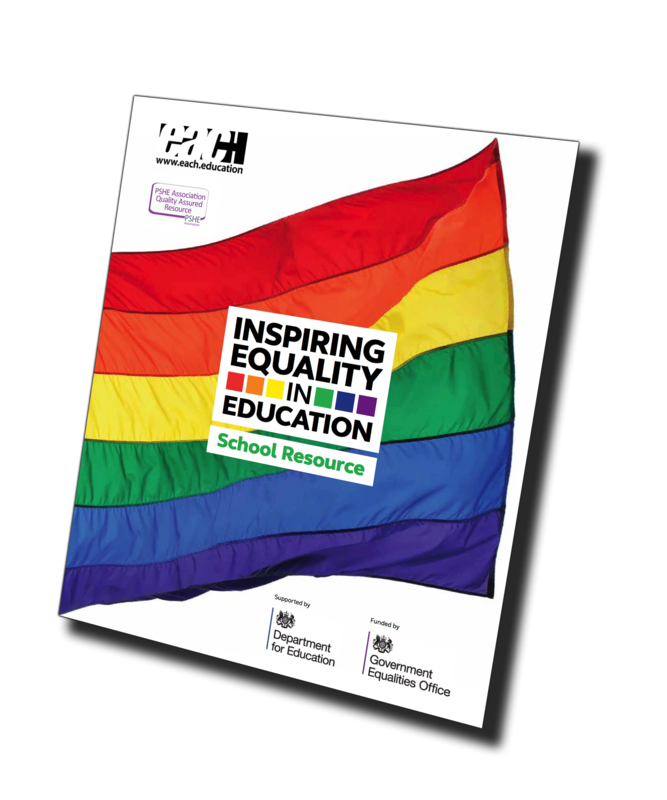 The Inspiring Equality in Education School Resource is the culmination of a Department for Education programme, funded by the Government Equalities Office to help address the findings that schools often lack confidence and feel under-resourced to deal effectively with homophobic, biphobic or transphobic bullying. The programme has seen EACH lead a consortium of national and local agencies to trial whole-school initiatives in ten West of England Schools, deliver training to over 700 professionals and produce a suite of quality assured practical resources. The Anti-Bullying Alliance, Sheffield Hallam University, Jan Lever Group and Off the Record Bristol all contributed to the resource adding their expertise in challenging all forms of prejudice-based bullying, mindful approaches to PSHE for KS1-2 and supporting trans and gender questioning young people respectively. The Anti-Bullying Alliance also developed guidance to support schools address homophobic, biphobic and transphobic bullying for disabled pupils and those with special educational needs. This includes a short and long guidance for school staff along with a literature review outlining the importance of the topic. EACH can visit your school to model the resource’s use in the classroom. All interested schools can telephone 0117 946 7607 or email director@each.education to book this.